For a vegan/vegetarian version of this dish omit the turkey sausage. Here is an easy, fairly quick, and filling stew. Although we prepare it with turkey sausage, it is easily made omitting the sausage for a vegan dish. First we sweat the onions and then add the celery, carrots, garlic, and turkey sausage. After picking over and washing the lentils, add them to the pot with enough water to cover by two inches. Add a bay leaf, a little thyme and season with salt and pepper. Bring to a boil and then lower to a simmer for about 25-30 minutes or until the lentils are cooked through. I ladle out a couple of scoops onto a bed of kale and serve some bread along side. Drizzle the whole bowl with extra virgin olive oil. 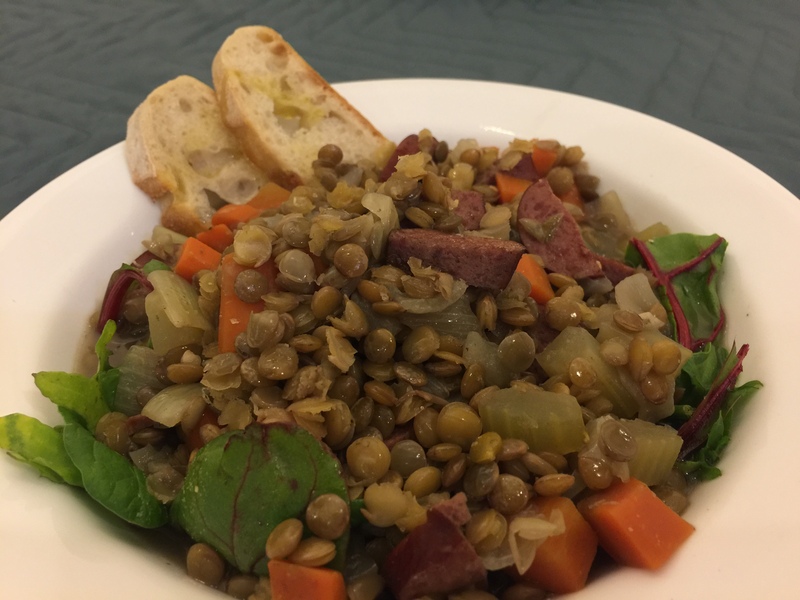 This entry was posted in Legumes, Poultry, Vegan, Vegetables, Vegetarian and tagged carrots, Celery, kale, lentils, Onions, turkey sausage, Vegan, vegetarian. Bookmark the permalink.